Close view of inscribed monolith at Bhagalpur. bl.uk > Online Gallery Home	> Online exhibitions	> Asia, Pacific and Africa Collections	> Close view of inscribed monolith at Bhagalpur. 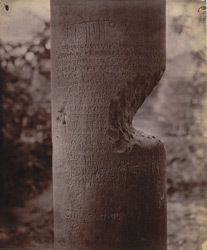 Photograph of the inscribed monolith at Bhagalpur taken by Henry Baily Wade Garrick between 1880 and 1881. A.Cunningham and H.B.W. Garrick mention the monolith in their 'Report of tours in North and South Bihar', written in 1880-81: "About half a mile to the east of the village of Bhagalpur, and quite close to the banks of the Ghagra River, there stands a monolith of rough grey sandstone...The shaft, a large portion of which has been hewn away near the centre, bears an inscription of twenty-two lines on its east face, also a short inscription in English, thus: Circa A.D. 900. I took a small photograph of the whole pillar, and a large one of the inscription alone [ie, this print]." The height of the pillar is seventeen feet and its circumference is five feet. The inscription is 21 lines long and written in what Cunningham calls 'Kutila' characters.